Possible Separation Anxiety – n.b. if the dog is barking excessively only when you are out, this is a sure sign a degree of Separation Anxiety is present. Bring in the use of the Separation Anxiety Spray and also refer to the modifications for use of same. All our products are designed so that they can be used together if the need arises. Please bear in mind that should the services of a canine behaviourist be required, do not hesitate to get in touch with me at admin@fods.co.za and if I am not in your area, I will refer you to somebody who can assist. These are the basic modifications relating directly to the behaviour concern - however a canine behaviourist will have other modification which will help to build the dogs confidence. When I go to see clients with behaviour problems, the majority of the time the owner has just not realized that the dogs needs not being met may be part of the reason for the barking – it is not that they are bad owners, that they are looking for solutions shows what good owners they are. What so often happens is that we buy our dogs toys but do not realize that a ball or rope, without somebody either throwing the ball or pulling the rope, can only provide limited stimulation for a dog. Many dogs are left at home during the day and they have very little to entertain themselves. Simply by providing your dog with the correct toys, such as one’s that are interactive. I do prefer that these toys are only given when the owner is out and here are a few ideas and always make sure these toys are safe and sturdy (dogs do chew and can swallow items) and inspect them on a daily basis for signs of breakage. Interactive Dog Toys which are designed so that you can fill same with some of the dogs food and as the dog pushes it around, kibble falls out which keeps the dog busy and entertained. Here is a link which will give you further ideas to consider. Many people believe that because they either have a large garden for the dog to play in, or they play with their dog daily that this will give the dog enough physical exercise – not so! A dog’s sense of smell is 45 times stronger than us humans, and this is approximately 200 million more scent cells that we have and in the hound breeds this can be 450 million more scent cells. A walk for a dog is not just something that should happen once a week, it is something that a dog needs! Just by taking your dog out daily can dramatically reduce behaviour problems. Dogs are not solitary animals, they are pack animals and it is a basic need they have. A dog that is left alone a long part of the day or is kept outside, is a very unhappy dog and is a lot more likely to engage in barking, destructive behaviour and even obsessive behaviour. They need to be part of our lives and spend time with us, especially in the home environment. If you have a dog that is disruptive when it does go inside, please get hold of a professional who can teach you how to turn this around or you can contact me at admin@fods.co.za and if I cannot assist will put you in touch with a behaviourist in your area. Many dogs that engage in excessive barking are just bored and frustrated and they have found both a manner to entertain themselves and also to get our attention. Attention to a dog is attention whether negative or positive. When we shout at our dogs to keep them quiet, we are actually achieving the opposite, as many dogs will perceive us to be joining in the barking when we shout at them to be quiet. So rather than shouting and screaming at the dog if it is barking excessively, let the dog see you and give a loud HUMPH!! as if you are total disgusted with the behaviour (which you probably are! ), turn away and stomp out the room. You will find that the majority of dogs will stop barking and follow their owner when the above response is undertaken. If this is the case, praise you dog i.e. 'good dog, good silence' and do try to divert the attention onto something else immediately to stop the dog going back to the situation that caused the barking. Try not to make this the same diversion every time as the dog may see this as a reward for barking and bark just to get the extra attention – yes they are clever! Some examples of diverting - the dog comes to you, praise, and walk away from the area dog was barking in OR say in a happy voice ‘lets go and see what xxxxx is doing’ and move away with the dog OR say ‘lets go and get your ball’ or you can even throw a toy. Just keep it varied. It is impossible to teach a dog to do nothing; a totally different, alternative behaviour must be brought in instead. In addition to using the spray twice a day, apply the spray to the dog and the area the dog normally barks in about 10 minutes before starting. In humans it takes us an average of 21 - 30 days minimum to break a habit, and this is simply what your dogs behaviour has become – a habit – you are now teaching an alternative behaviour to an old habit. In the case of a dog barking excessively at the door bell, have a few very tasty and smelly treats with you. Arrange for somebody to come and ring the doorbell. As the dog starts to bark, say ‘bark, bark, bark’ about 3 – 5 times. It is important that the dog is allowed to perform its natural behaviour of warning us of a possible intruder and guard its human family. After saying ‘bark, bark, bark’, hold the lovely smelly treat right in front of the dogs nose (a good idea to start this exercise when your dog is hungry) and as the dog silences, say ‘good silence, good dog’ and reward with the treat. The person will then ring the doorbell again and the above exercise is repeated. Gary Player once said ‘the more I practice the luckier I get’, so practice, practice, practice the above exercise five or six (or even more) times in a row. Once the dog has the hang of the above, you will be able to ask your dog to both bark and silence on cue – it does take practice! Also do this exercise at various times during the day. Do try and bring in the ‘bark/silence’ exercise above in the home environment and then you can also use it in the car. How much your dog barks in the car is up to you. Personally I allow my dog to bark in the car if somebody is approaching my car when stopped at a robot – my dog is just doing his job. However, excessive barking can be really annoying and even dangerous as we lose focus on our driving. In addition to applying the spray twice a day, spray above the dog and in the car before going for a drive and do this exercise at a time when you have the time and the roads are quieter. The easiest manner to stop a dog barking in a car is management. Simply teach the dog to use a crate and put the crate in the car with the dog inside. To make this more rewarding for the dog, you can use a good quality chew toy stuffed with treats which is put inside the crate when driving – the dog only has access to this special chew toy when in the car. If the dog is still barking in the crate, simply drape a cotton cloth over the crate. Please make sure that there is more than sufficient airflow for the dog if this occurs. If you feel your dogs barking in the car is due to fear issues, then consider using our Excessive Anxiety spray at the same time. If your dog is nervous of new people, then start by introducing the dog to only one person at a time and start with people the dog is better with e.g. some dogs prefer women to men or children as an example. The dog will be on lead and the person that is going to say hello to the dog will stand side wards and not stare at the dog and toss treats towards the dog. As the dog eats the treats and gradually comes closer its stress towards strangers will reduce. As the dog gets close to the person make sure that the next treat is offered with an open palm to prevent snatching. It is the dog’s decision to approach. When the dog takes a treat in this way, be mindful not to bed over the dog (seen as dominant) and rather scratch gently under the chin. ​Basic TTouches to relax your dog. It is my belief that if each and every owner learned the basics of TTouch our animals world would be a much better place! 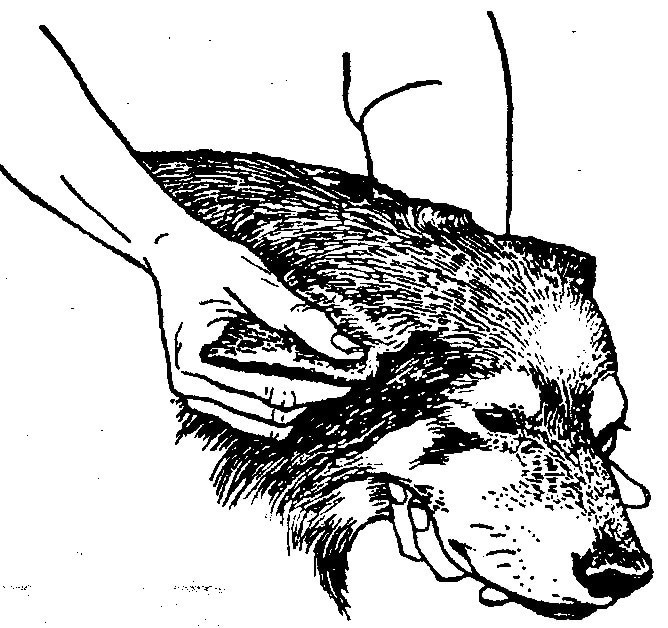 Until you learn how to do TTouch (and Scotty does offer lessons), here is an Ear Touch you can use as well as some basic Acupressure stroking techniques - both of which, especially when done daily, will help to reduce your dogs stress levels. Although you are not doing actual Acupressure, just stroking in these areas with your fingers - using a gentle pressure, will help to reduce anxiety. Stroking the ear as described, is one of the most important things you can do for your pet. Even a few minutes working on the ears can be beneficial. The ears (and base) contain over 200 acupressure points which will help a pet (or human) relax and stroking the tips of the ears can actually prevent shock. The Ear TTouch is also great for all stress, digestion, fatigue, circulation and car sickness. Gently stroke from the base of the ear to the tip. Supporting the head with one hand hold your thumb on the outside and bent fingers on the underside and stroke outwards towards and over the tip of the ear. Yin Tang. This is found in the midline of the head just above the eyes. Stroke gently from the middle of the muzzle area and between the eyes and will feel a slight indent. This helps dogs with mental focus and clarity. Yang Tang – This is found about one fingers width on the outside of the eye where the upper and lower eyelids meet. Helps with fears and anxiety and anxiety related behaviour such as excessive barking to mention just one. Just stroke gently in this area. GV20 – Found in the middle of the top of a dogs head about halfway between front edges of the ears. If your dog has a prominent occipital bump, it will be just in front of this. This is one of the main calming points on a dog and helps to calm the mind. Great for fear, anxiety, reactive behaviour. After stroking over the Yin Tang area, you can just continue stroking between the eyes and over the top of the head. Behind the ears - the above diagram does not show this position, however just run your fingers gently behind the ears, from top to bottom. As you go to the bottom of the ear at the base of the neck, following the line of the ear, you will feel a bit of a dent - stroke back and forwards over this area. This is GB20 and very good for stress. Bai Hui – dogs love having a good scratch in this area – they know better than us! It helps to generate energy along the spine and hind legs so great for helping older dogs. Also a very good calming point. You will find this in the middle of the back, between the hips (sacrum area) and the area feels flat to the touch and you can’t feel the spinous process underneath.